Ana Mardoll's Ramblings: Open Thread: Pick Your Poison... In Easy Flowchart Form! Read Sunshine. Read it now. I cannot recommend this book highly enough. It has only one, single flaw: there isn't a sequel. So sharing this on facebook! I wound up at Mists of Avalon, haven't read yet but have heard fantastic things. Maybe it's time to give it a go. But maybe I'll read Neverwhere, if I ever find a translation. I ended up with The Legend of Drizzt which I have read, along with the next 4 books in the series. I am amused that down in the left corner, "Like stories about orphaned farm boys?" only has a No option, which in turn leads to "Tough" and stories about orphaned farm boys. Also that saying no to dystopian fiction gets "Sounds like you need a good allegory" and leads to Animal Farm. Tricksy. 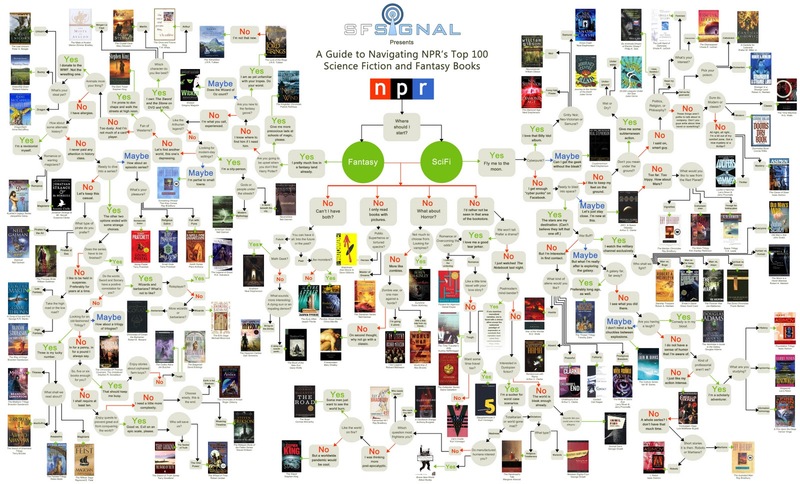 I tried following it to a few suggestions, but by the time it gets to specific final questions and books, the font has gone all blurry and illegible, and the only book covers I can recognise are those I've read or rejected already. I ended up with the Mists of Avalon. (Scanning upwards, I see I am in good company.) I have to admit, the few Marion Zimmer Bradley books I read were . . . not quite my cup of tea. They were part of the Darkover series. Anyone read both and can tell me whether it's worth checking out MoA? I loved Neverwhere; I even watched the Doctor-Who-y series on BBC. I do not think I agree that Frankenstein is horror, at least not in the sense that I'd use the word for genres. It's less horror than, say, Animal Farm or Lord of the Flies. Redcrow: yes, yes, yes, read Neverwhere! I loved it so much that I have a hard copy, a Kindle copy *and* the audio book on MP3. I thought you had it narrowed down to three things. well, being an only slightly picky reader, I ended up with a long list of books. I almost immediately got The Eyre Affair, which is actually one of my favourite books. This chart wins. Oooh boy. You . . . might want to read some of the reviews before tackling this one. The focus changes dramatically over the course of the series, and if you start it as light reading, you might be in for some surprises as to the change in tone. And philosophy. There's a lot more to the Hyperion Cantos than an impaling demon. For example, the first book is a Canterbury Tales type situation, which includes things like the Detective's Tale, a noir story where the dame is a recreation of John Keats, and the Scholar's Tale, where the scholar's daughter starts aging backwards while he begins having dreams that tell him to recreate the sacrifice of Isaac by Abraham. Randomly, I don't consider Frankenstein to really be horror, either, but then again I didn't really LIKE it. I don't care for the literary technique of addressing the reader with little moral interludes. Meh. 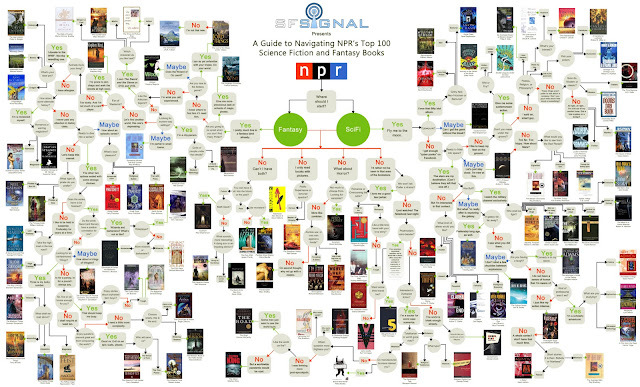 I first saw this a few days ago on the Tor site, and I appear to be the only person who hates this chart. One of the drawbacks of being a professional Book Recommender, I suppose. I look at lists of "If you like X, you'll like Y" and usually start twitching; they always seem to rely too heavily on subject matter and tropes, and not enough on what we call in the trade "Appeal Factors" -- i.e., what made THIS particular reader like THIS particular book. Sometimes it's subject, but often not the subject you'd expect (e.g., I know an awful lot of children who loved the Harry Potter books not for the fantasy, but because they were "school stories" or "friendship stories") but often it's something else entirely: Plot-driven vs character-driven vs setting-driven vs idea-driven? Tone? Style? Voice? Well, if they try to recommend something as being about "impaling demons", it's not exactly my fault if I get no desire to check further. "A noir story where the dame is a recreation of John Keats" would grab my interest. That's why I prefer long, in-depth reviews (with spoilers, if possible). I wouldn't say I hated it, but it didn't work for me - not enough options, not enough details. That comment on its own is enough to make me crave cinnamon rolls. I think it's got serious problems, but I think most of these kind of charts have serious problems. Though putting Bujold's Vorkosigan saga after "I have no sense of humor" just boggles my mind. The Culture series (found after maybe instead of no to humor) sounds more serious (one of the reasons I've never read them). Dav, thanks for the heads up about Sword of Truth. I've looked at some reviews and I really don't like anything by Ayn Rand -- I read some of her stuff and I can sympathise with where she was coming from but I disagree with her. And I'm not sure I could stomach a long series of objectivism. And somewhat else mentions that every female characters gets raped and/or beaten up, which is one thing that bothered me about a Song of Ice and Fire -- though the main thing that bothered me about a Song of Ice and Fire was that I wasn't interested in all of that politicking and trying to capture the throne and I mostly wished I could skip all the bits that weren't about Arya and Jon and the undead guys up north. and the puppies. well, and the dragon girl is cool too. So I got bored of it. So I'll cross that off my to read list. And miss the chicken that was no chicken, but evil incarnate? Why would you want to do that? I have no doubt that plenty of writers could make a scene with an evil chicken work. It's like the way that Clint Eastwood made "Get off my lawn" sound badass. I never made it to the chicken, honestly. The books are terrible, but I thought the author was going for something very interesting, where the books start with very stereotypical tropes, and the main character goes from backwoods hero to king to tyrant. I kept expecting the big reveal, you know "But now you have BECOME the thing which you hate!" So I pushed through. It turns out that I was setting my expectations WAY too high. TW: Violence against kids. V gubhtug gur cneg bs gur svefg obbx jurer bhe ureb xvpxf gur wnj bs na rvtug (?) lrne byq tvey naq funggref vg jnf n ovt cbvagre gb gur funqbj fvqr gb qrirybc bire gur erfg bs gur frevrf, ohg ab, nccneragyl jr jrer fhccbfrq gb fvqr jvgu uvz ba gung. Actually, I never made it to the chicken, either. Like you, once I realized that the author didn't see what was wrong with his hero, I chucked the series. I think the fact that it is possible to make the mundane - like a chicken - frightening, but Goodkind failed utterly is why the chicken scene is so infamous. Hell, Monty Python's Vorpal Bunny is more frightening than Goodkind's chicken, and that scene is hilarious. Buh. I knew about the series mainly because of the "riding down the evil pacifists" scene, but I thought it was just the later books that got all weird and Rand-y. That's from the first book?